Who is That Horse Staring at Me? 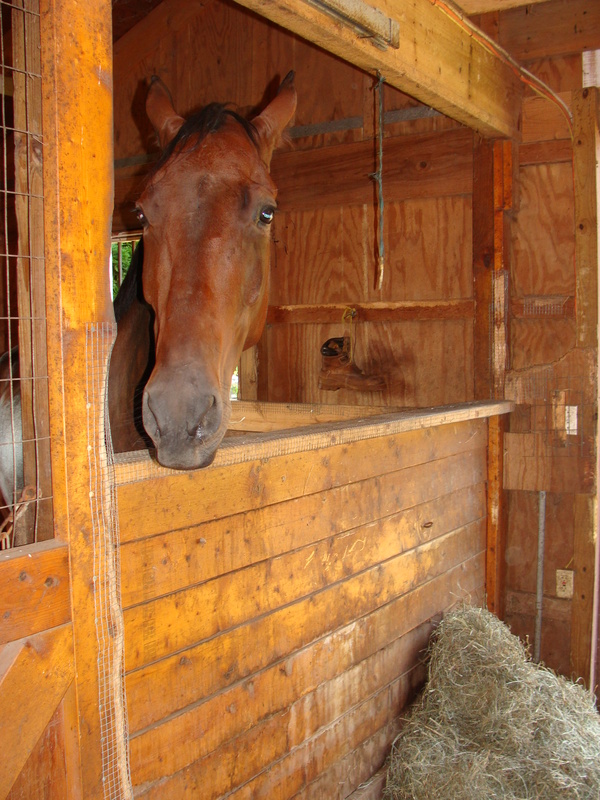 It has been a busy couple of days for Ike and now he is tucked safely into his stall for the night…and don’t worry, that pile of hay is now on the other side of the stall. There would have been loud protests if it wasn’t. I was down for the count yesterday. My snot gland kicked into overdrive, and I spent the day in bed begging the cooties to go away. They have been around for a week and have outstayed their welcome. Since I wasn’t riding, I had Ms. C pop on Ike to help gauge his recovery and our progress. Ms. C felt some wobbliness in Ike’s right hind to start especially when she tracked to the right at the trot. She would stop and restart and gave Ike the chance to work out the kinks. Ike was stable tracking left. By the end of her ride, Ms. C felt that Ike had improved and that we must be still dealing with some stiffness from the vaccines. Thankfully, it is not lameness. Too bad I can’t fire up the hot tub and let Ike take a soak. Now that would be a sight to see. When I awoke today, the first thing I did was breathe in and out through my nose! It is sad the things that can make me happy. But having had to mouth breathe for the past week, it was nice to know that I’m now on the road to recovery…hope I can walk fast enough to catch up to Ike. I arrived at the barn with about an hour to groom Ike and load the trailer. Wouldn’t you know it, today was the day that Ike decided to wallow in the new mud like a pig. Worst part was that it was still wet when I had to start grooming, so all the curry comb did was smear the mud into pretty swirls. I broke out the bucket and rag and did my best to wipe away the offending mud. [Note: As I was riding Ike today, I noticed the clumps of mud I missed in his mane. Nice touch.] Poor Ike was also doused in show sheen – it was my feeble attempt to disguise his filthy condition. Perhaps Becky would be blinded by the gleam of his coat…fat chance. Beauty shop time was over and I quickly loaded the trailer. Wish I could have two of everything to avoid this process, but the long-lost rich uncle has still not materialized, so we load and unload with each outing. 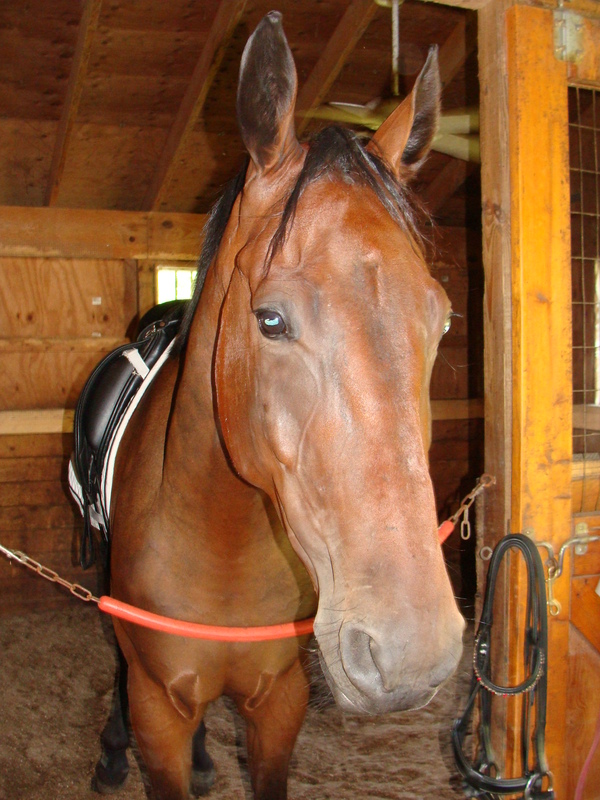 Today was another milestone for Ike – his first experience in an indoor arena. The indoor today is large and bright, the doors were open, and I hoped for the best. Ike would not stand still at the mounting block. He kept sidepassing away from it, so Becky finally suggested I walk him around a couple of times to let him check things out. It wasn’t until the ride home that I realized that Ike saw his reflection in the mirror near the mounting block and didn’t realize that he was staring at and moving away from himself. Silly boy. Ike made me a very proud horsey mom today. Becky liked his look, his demeanor, and his movement. 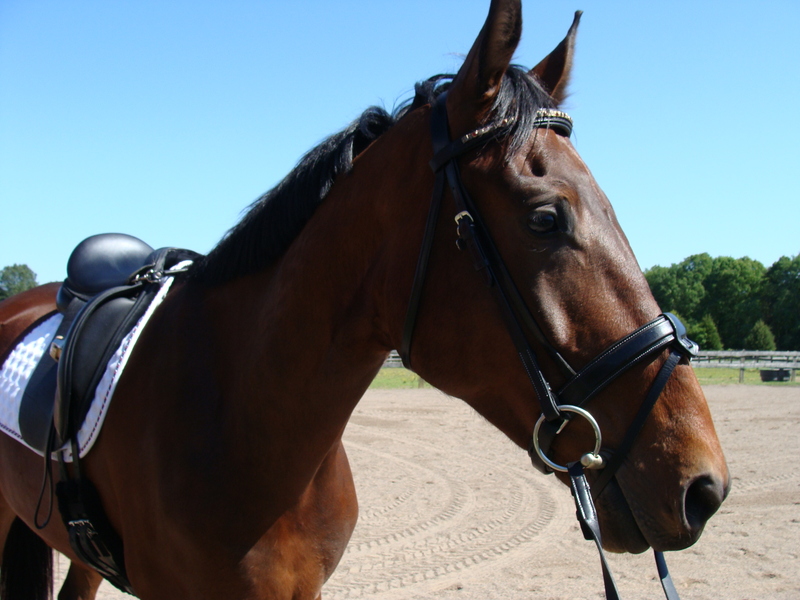 She repeated the same things I hear from Ms. C on a regular basis – too much inside rein, you are overbending the neck, sit up, your weight is too much to the inside/outside, don’t lean back in the halt…hmm, yet again rider error is the source of the problem. Too help with my tendency to be too strong with one rein, she had me bridge my reins and ride. Ah, a bit of a light bulb moment and what a difference it made to Ike’s straightness. It forced me to keep my hands quieter and steadier. Not something I had even considered trying, but I will continue to bridge the reins on subsequent rides to rethink my overuse of the inside rein. I thoroughly enjoyed the clinic today. Got to visit with old friends, see some lovely horses, and come away with some new tips and the feeling that Ike’s journey down centerline is going to be a blast as he matures. Before I update you on Ike’s condition, I feel I must apologize for my less than humorous posts the past few days. It is sometimes hard to see the glass as half full when life is siphoning the water out before your eyes. But Ike and I are rallying and are back to work with good spirits. Two outings are in the works in the next couple of weeks, and we’d like to put our best hoof forward as we venture back out under public scrutiny. We have a clinic with Rebecca Langwost Barlow on Friday and our next schooling show is on October 7th. Dare I say that I’m more nervous about the clinic with Becky than I am about riding the two tests? Tuesday dawned a cool and glorious fall day. Had to be at the barn early for Ike’s pedicure. Sadly, his feet are much more presentable than mine…maybe I should try some bell boots to hide their wretched condition. I then went home and finished my work day. It was too nice a day to not ride, so I headed back to the barn after work to have my first lesson with Ms. C in over two weeks. She has an incredible eye for the movement of a horse and can see things that people like me miss. Right away she spotted a small hitch in the movement of Ike’s right hind leg…the one that had the worst trouble last week. She asked if I could feel it, but it was so slight sometimes that I felt nothing. Other times it felt like Ike would trot a few steps, take one skip step, and then get right back to trot. There was nothing screaming “ouch,” but Ike definitely is not back to full steam yet. And since we are laying it all out there, my skills were a bit rusty today as well. It is very clear that I require weekly adult supervision to keep me on my toes with my fingers closed, legs relaxed, and reins the proper length. Ike and I started off with work that would have earned us a 5.5, but ended the lesson with work that could get us a 7.5. It was agreed that Ike’s movement improved over the course of the lesson, so hopefully it is just a matter of working out the kinks to get us back to show form. This past week and a half have been a rollercoaster ride of emotions. Emotions were already raw from saying goodbye to my beloved hound dog when Ms. C informed me that my Big Man was struggling after receiving his annual vaccines. I can’t tell you how tempting it was to pack up my suitcase, hop on the ferry, and blindly drive home through the tears while wiping my nose on my sleeve. My husband was the voice of reason and gave me a big, reassuring hug, “Ike will be OK.” Sigh. All I could do was wait for Ms. C’s Tuesday morning update and then know whether Ike would be staying put or heading up the road to the vet hospital. Needless to say, Monday night was rather sleepless. The email I’d been waiting for arrived mid-morning (email and text messages were more reliable than phone service on Ocracoke Island, NC). Ike was better! Ms. C and Mr. D felt that there was enough improvement with the administration of the Bute that Ike did not need to head to the clinic for further evaluation. Ah, I could now breathe. We were not out of the woods, but our vet felt that if the Bute helped, that there was no need for evaluation for EPM or other neurological problems…Bute wouldn’t help those issues. I did my own research online, but could not find anything conclusive on vaccines and the symptoms Ike demonstrated. The scientist in me will keep digging for an answer. In the mean time, I was just tickled that Ike was improving. Ms. C kept me updated with daily emails and phone calls when I had cellphone reception. By Thursday, Ike was banging on his bucket for breakfast and marching with great purpose to his paddock in the morning. She tried lunging him with limited success. For one, I’ve neglected that part of Ike’s education…he is such a mellow fellow that he never needed lunging before I hop on for my ride. And then, he was obviously still hurting a bit because he pinned his ears and would stop. Ear pinning is not a normal part of his repertoire, so we knew he was still not 100%. He was allowed the time off to heal. He did manage a good romp around his paddock one day which again was a positive sign of progress. I was home for barely an hour today before I high-tailed it to the barn. There was no way I was waiting any longer to see Ike. There he was, peeking through his window. Silly boy, inside on such a pretty day? I didn’t care. I must admit that I think he was a bit miffed at me for not being with him. I received some ear pinning and a “gentle” bite on my hand as punishment for leaving for the week. It was interesting to note that the horse’s coats have darkened considerably in the week I was gone…winter coats are growing in quickly with our cooler nights and shorter days. Sorry, the mind wandered for a moment. Ike was clean so it took no time to get him tacked. My friend M and Mr. D came out to watch me ride since they’d seen Ike at his worst and would be good at judging his progress. They were both pleased with what they saw. I rode walk, trot, and canter in both directions. 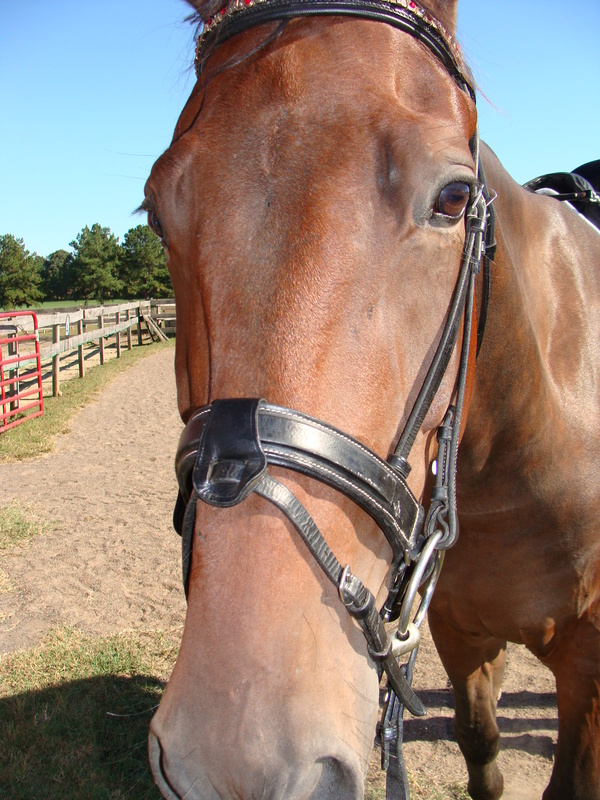 The only time Ike pinned his ears was when I pushed for a more forward trot. I was okay with that. M saw some awkward steps on my centerline turns. I’m okay with that as well. My big, beautiful boy is on the mend. In closing, I must share that I am eternally grateful for my friends Ms. C and Mr. D and the care and concern they have for my boys. My boys are part of their extended family and are treated as such. It makes it possible for me to go away from time to time and know that I need not worry. (that doesn’t mean that I won’t worry, but I don’t have to worry.) Now the question is, how do I properly thank them for their care. “Thank you” is not enough. That will be what I ponder as I head to bed tonight. It has been another rough couple of days so my opportunities to post have been limited. My mind is too distracted to type a cohesive thought. We said goodbye to our dearest 15-year-old hound dog, then the brand new washer leaked water all over the laundry room floor and ruined the flooring and quarter round molding, our home printer/fax leaked black ink all over the table and had to be replaced, and now my dearest Ike is having difficulties from complications from his fall vaccines. Then Monday dawned and something was definitely not right. Ike was showing some neurological symptoms in his hind end. He was broken even at the walk. My heart skipped a beat and my stomach churned. To add the cherry to the pile of poo, I am a couple of hundred miles away and not with my boy. It is killing me, but I know that he is in the best of care with Ms. C and Mr. D. The vet came back and it was decided to give him more Bute and watch him for 24 hours. If there was no improvement, he would go to one of the vet hospitals. Say what? How is this possible?! It is a nightmare and I can’t seem to wake up. Ms. C said to be brave. I clutched my stomach and clicked my heels together hoping that I’d wake up and all would be well. I hate that my big man is unhappy. All fingers and toes are crossed that he will be back to his old self again soon. In my family, our animals have always been an integral part to the family. They were never cast to the basement or to the backyard to never get love and attention. The dogs came on family road trips, to the Philippine Islands when my father was transferred, and practically had a spot at the dinner table. That tradition continues to this day, except the horses have their own feed buckets and I don’t foresee any overseas travel in our future. The dogs have the run of the house and they know it. So it is painstakingly hard to see them age. Can you see where this is headed? 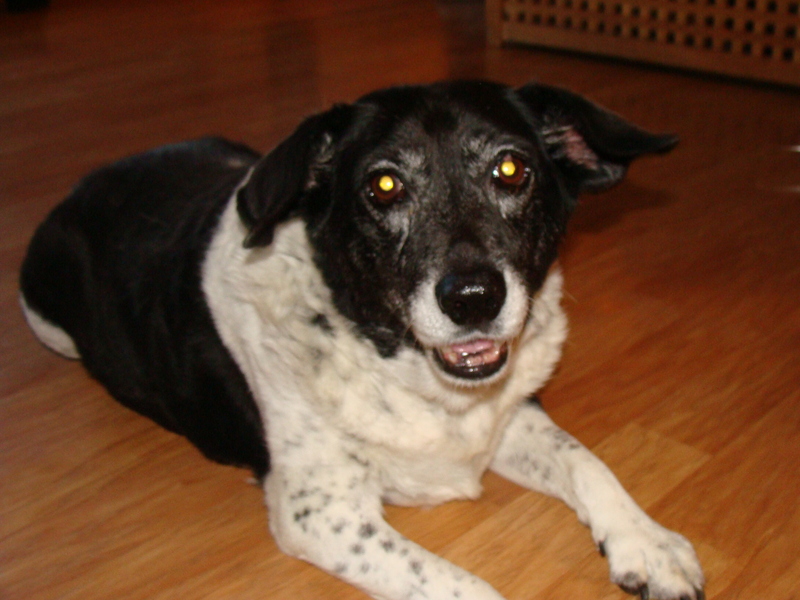 My dearest hound dog Holly was 15 years old and my heart breaks that I had to say goodbye to her this morning. This past week has been challenging and the days to come will be even more so since I will not see her smiling doggie face when I come home. You agonize and cry and smile through the tears at the happy memories. My mind has been so distracted that I have only ridden once since my lesson earlier in the week. It would be a disservice to Ike; I learned that lesson years ago that ended with a black eye from my face connecting with Cigar’s neck. There are some days that it is best just to groom and pass out treats and share my thoughts with my equine family members. Cigar’s nickers brought a smile to my face. Ike is the silent type, but seeing his face peek at me through his window warmed my heart. I like to think they sense the pain and would hug me if they could. I know that time will make the hurt lessen, but for today, my heart grieves and my tears flow freely. So we changed things up this week and had our lesson on Monday rather than wait until the end of the week. Why not right? Sometimes changing your schedule or the way you do things helps to give a fresh perspective on things. And speaking of fresh, the boy was definitely feeling a bit fresh today. He must like the change in the weather, but who can blame him. It was 71 degrees with low humidity and NO buzzing terrorists in sight. Maybe it was his way of celebrating their departure. Not sure if they are gone for good, but the cooler temperatures should send them packing soon. We started the lesson with the walk – a very underappreciated gait in my humble opinion. Not very glamorous, but if you can’t establish a connection while walking, you might as well throw in the towel at the trot and canter. Ike does hear half halts, he just choses to ignore them some days. Ike’s freshness today translated into “la la la, I can’t hear your half halts,” so we opened the lines of communication while walking. I half halt and nothing happens, so I HALF HALT and Ike halts. I feel like Goldilocks, too much, too little, just right. I just need to learn that just right feeling and Ike needs to pay attention when I ask. So much work to do on such small details. Moving on to trot, Ms. C had us establish a forward, rhythmic trot about 4 feet off the rail. Ugh, that means I can’t cheat and have the rail “help” keep us straight and between both reins…sigh, Ike and I have to do all the work. Well I am pleased to report that we succeeded in the stay straight department, but were less than stellar with our throughness and connection. Ms. C called us out immediately. “Where was your half halt there?” Fudge. Nothing gets past her keen eye. She is right though. So I listen intently as she calls out what to do and pray that my body cooperates and does what it asked. 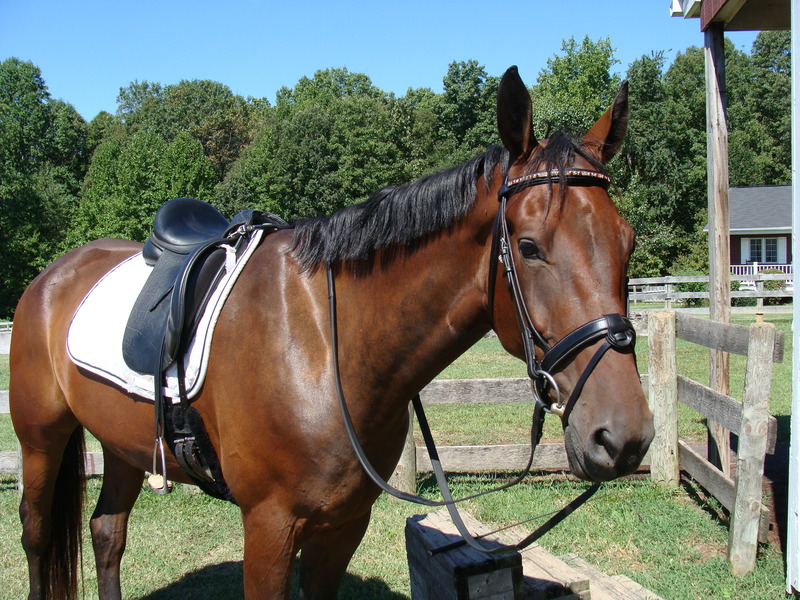 By the end of the lesson, Ike and I were pushing for a very forward trot on the long sides, I’d half halt and we’d slow down the trot on the short ends, and push-off again down the next long side for a trot that could grab us an 8. Ah, that is what a good half halt can do. All well and good, but the trick is to re-establish that feeling on my own and then in the ring as we head down centerline. We also worked on the trot loops and canter patterns for Training Test 3. Um, ah, um, yeah. We have a lot of work to do before October 7th. The loops should flow, but we are a bit too herky-jerky (think of Elaine dancing on Seinfeld). Screech, we are at X and need to get back to the rail…too much with my hands. Our canter needed half halts that were too numerous to count. We attempted the turn onto the long diagonal and trot at X. The turn was better than yesterday; the down transition started at the quarterline and might have happened in the vicinity of X. I had to work for that one since Ike was just as fresh when it came time to canter as he was when we started. Our right lead canter was more like Marmaduke running with the landscape a blur. Half halts were not even half heard. “Say what? But look how fast I can run.” After some time on a trot circle, I whispered canter. It was still fast, but at least Ike heard me when I’d half halt with my outside rein. It is going to be an interesting fall and winter if Ike’s freshness blossoms. Hopefully everyone was able to find some time today to get outside and enjoy the weather. What a relief it was to be able to take a deep breath of fresh air sans 100% humidity. Fall can’t be too far away which means the oppressive heat will retreat until 2013. The entry for our next schooling show has been mailed. We shall attempt Training Test 2 and Test 3. I’m still not certain if we are ready for Test 3, but we will give it a go and keep fingers and toes crossed that we don’t embarrass ourselves. There are parts of Test 3 that are familiar, but I have to admit that the change of rein at the canter will be a challenge. After all, since I still don’t have good control over Ike’s shoulders, how can I be expected to turn from the short end and onto the diagonal without some drift occurring. Case in point, today was a perfect day to check on the straightness of my lines and to check for drift. The gorgeous weather today was preceded by rain storms yesterday. The bluestone was smooth and we were the first ones to ride. Ike performed a smooth left lead canter transition, we finished our circle, and headed toward the short end. Had to give Ike a little bump as a reminder that he was still to be cantering (I think he recalls the other tests when we down transition before the short end.) We made it around the short end and we made the turn to the long diagonal with probably too much inside rein. Attempted a down transition in the vicinity of X, and I also tried to remember to half halt a couple of strides before X. Then made our way back to the other end to check out our travel path. I should have taken a photo. Hmm, it definitely drifted too far right and I had to guide Ike back to the correct line. The worst part is that you have to make that turn right down near the judge…uh-oh. No chance that it will slip by unnoticed. At least we have a month before we go. Perhaps we will have one of those “and then a miracle occurs” moments and everything will fall in place. Yes, I like to share our difficulties and challenges, but I do continue to be amazed at Ike’s progress. 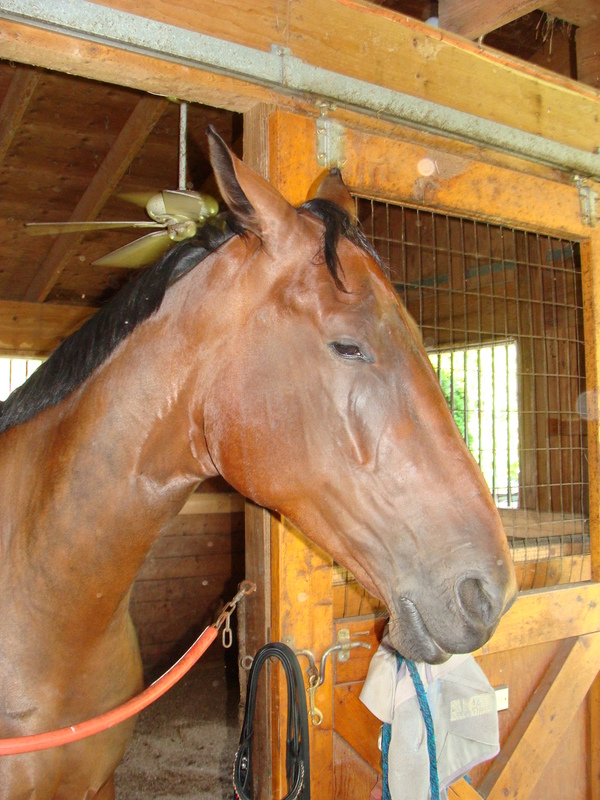 My only comparison is with Cigar (my now retired OTTB). It took almost 2 years to get Cigar to canter in both directions when asked and without improvisation during the up transition (judge’s comments usually included such descriptors as “playful” or “disobedient.”) I feel truly blessed that I now have a young horse who is so giving and kind. We will be back in the saddle again tomorrow.